Nole just 405 points behind Nadal, finals of Roland Garros guarantees no.1 spot! With the title at the Internazionali BNL d’Italia, Novak is one step closer to position number 1 in the world rankings. In the ATP Ranking list as of Monday, May 16, the champion of the ATP World Tour Masters 1000 tournament in Rome, has 11,665 points which is 1000 points more than last Monday. Rafael Nadal is still first with 12,070 points. 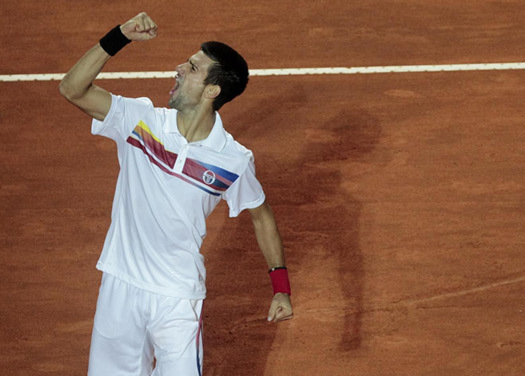 The Spaniard has only 405 points more than Nole – Invictus, the winner of seven ATP titles this year. The position number 1 in the world rankings has never been closer. Novak could reach the no.1 spot for the first time in his career after French Open. Djokovic will defend quarter-finals, 360 points, the defending champion Rafael Nadal won 2000 points last year. Nole can claim the top if he reaches finals in Paris. There are also other scenarios. If Rafa does not take the title at Roland Garros, Novak will reach the no.1 with any performance at the second Grand Slam of the season..
Novak became the first player to qualify for 2011 Barclays ATP World Tour Finals in London which will take place at The O2 Arena from 20-27 November. In the ATP race list, which leads to the final season event, the best Serbian tennis player has 6,975 points.